Rachow's nothobranch or othobranchius rachovii belongs to the family Aplocheilidae. These fish are natives to regions of Africa where lakes and ponds evaporate and dry up in the dry season. 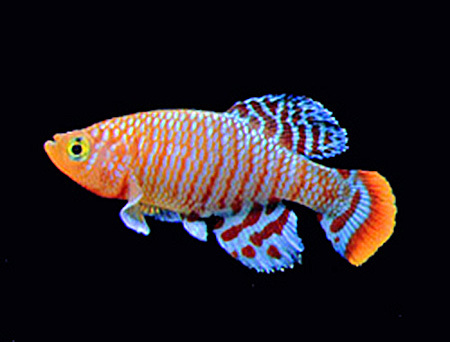 Because of their environmental challenges, the nothobranch has become commonly referred to as a killifish or an annual. If you are familiar with gardening you will know that an annual only lives a single season. They survive in nature by releasing their pollen to insure subsequent generations. Nature has equipped the killifish to adapt to their hostile environmental conditions in much the same manner. This species flourishes during the wet season. As the wet season draws to an end their habitat begins to disappear. They lay their eggs in the mud before the last of the water evaporates. Then they perish for lack of water. Their eggs, however, survive insuring the survival of the species. The eggs baked in dried up lake beds until the rains return. Undergoing this dry period has proven to be essential to the eggs hatching. When the wet season returns and the ponds and lakes start to fill back up the eggs hatch and the Rachow has triumphed over nature. Killifish are found in every region of the world except northern Europe, Australia, and Antarctica. There are several genera and different species within each of these genera. A small number of species will shoal while most are territorial to varying degrees. Each has its own breeding habits and life span determined by it specific environmental conditions. But the Rachow's nothobranch killifish is known as an annual because it dies every year. Even in the relative safety of an aquarium the Rachow's nothobranch is victim to its evolution. They only live to 1-1.5 years. These are small fish. A fully grown adult is only about two inches long. They thrive in slightly acidic water; pH 6.5 with a temperature range between 74-79 °F. They are considered a peaceful fish but a heavily planted mono-species aquarium is recommended. Rachow's nothobranch are carnivores. They will readily eat live food such as brine shrimp, tubifex and bloodworms. They will also eat freeze-dried, frozen and meat based tropical flake food. Breeding these unique fish is done differently than just about any other commercially available fish. Start by placing a 2-3 inch layer of peat on your existing substrate. The peat is for spawning. The killifish will bury their eggs in it. Once they eggs are deposited into the peat remove it from the aquarium. Allow the peat to dry and then place it in a plastic bag. Make sure there is no moisture left in the bag to prevent mold growth. Store the bag for 3-4 months. After the eggs have undergone an extended dry period remove the peat from storage and place it in a breeding tank. Fry can be fed newly hatched shrimp brine, powdered fry food, or powdered eggs. Allow them to mature enough to hold their own before introducing them to the adult population in the main tank.